Britain the United Kingdom (UK) call it what you may, stands accused of mentoring Ulster loyalistparamilitaries during The Troubles, within what they call Northern Ireland and sponsoring cross-border operations into the free stae or waht some call the Republic of Ireland. In the 1970s, loyalist extremists known as the "Glenanne gang" carried out mNY shootings and bombings against THE Irish Catholic and Irish nationalist community. The gang included the illegal Ulster Volunteer Force (UVF), the British Army and police officers of the Royal Ulster Constabulary (RUC). It wascommanded by British Military Intelligence and RUC Special Branch. The human rights group the Pat Finucane Centre attributed 87 killings to the Glenanne gang which includes the Dublin and Monaghan bombings (which murdered 33 civilians), the Miami Showband killings and the Reavey and O'Dowd murders. Britain is also accused of providing intelligence material, training, firearms, explosives and lists of people that their secret services want murdered. On 17 April 2003, Sir John Stevens published his third inquiry on collusion between the British Army, the RUC with Loyalist paramilitaries. It stated there had been collusion in the high-profile murder of solicitor Pat Finucane. In 1999, RUC officer John Weir made a sworn affidavit in which he admitted colluding with loyalist paramilitaries implicating many other police officers and soldiers with the same. He recounted in detail the killings of 15 Catholics, claimed his superiors had knowledge of 76 more assassinations carried out by the UVF. He also alleged that Britain's SAS murdered Loyalists who planned to expose collusion. December 16, 2012 "Information Clearing House" - This story connects far-flung places. Kenya, Malaya, Northern Ireland and now Syria. 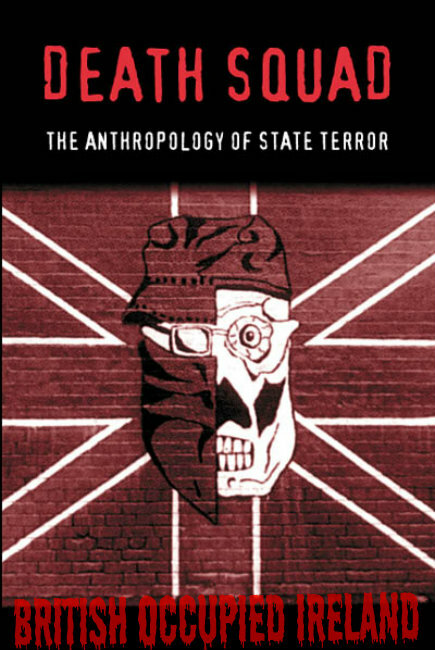 The one over-arching theme is British counter-insurgency strategy, or more plainly, the use of state terrorism by British forces to achieve political objectives. The story came alive again this week with two seemingly unrelated news developments. First, we learn of deeper involvement of Britain’s military in the violence raging across Syria. British military officers and Special Forces are reportedly training - in Jordanian territory - foreign-backed militants to step up their campaign of terrorism across Syria. These terror gangs, whom the Western mainstream media call “freedom fighters”, have been plunging Syria into bloody chaos for the past 22 months, with car bombs ripping through civilian neighbourhoods and death squads massacring whole villages, the latest being Aqrab in Hama Province where over 125 people where murdered this week. Ample evidence shows that the mercenaries, recruited from various countries including Libya, Saudi Arabia and Iraq, are covertly supplied with weapons and training from Britain via conduits of Saudi Arabia, Qatar and Turkey. The surge in violence and killing of civilians, with a notable agenda of inciting sectarian war, is proof that the British expertise in fomenting terror is paying dividends for the Western imperialist objective of destabilizing Syrian society and the government of President Bashar al-Assad. The second development this week was the publication of an official British report into the murder 23 years ago of Belfast lawyer Pat Finucane. The two issues, Syrian violence and the killing of Mr Finucane, are intimately related - although the British government and its media have done their best to bury any connection. Let’s unravel the layers of obfuscation. When the review of Mr Finucane’s murder by Sir Desmond de Silva QC was published this week, British Prime Minister David Cameron offered an apology to the family of the Belfast man. “I am deeply sorry,” said Cameron in the British House of Commons, and he went on to acknowledge that the killing pointed to “shocking levels of collusion” between British security forces and loyalist death squads. The latter were paramilitaries recruited from Northern Ireland’s pro-British civilian population that perpetrated many heinous murders during the conflict in that territory between 1969-1994. However, the widow of Mr Finucane and their children denounced the latest review as a “white wash”. Geraldine Finucane has good reason to dismiss the report because it portrays the murder of her husband as a rogue act of violence. Cameron added to the white wash by saying that the case represented a “failing” by the British military forces to prevent the murder. This is typical official British deception. For what the murder of Pat Finucane reveals is not a failure, but rather a successful deployment of Britain’s policy of state terrorism - a policy that involved the systematic collusion between British military intelligence and loyalist death squads. This practice was and is a central part of British counter-insurgency tactics - a policy that was overseen from the highest office of British government in Downing Street. Much of Britain’s “dirty war” strategy, as an institutional practice, can be attributed to one of its most decorated military commanders - General Sir Frank Kitson. Kitson published his war manual - Low Intensity Operations - in 1971. It has since become a standard text for British military counter-insurgency techniques, or as we have noted, state terrorism. In 1970, the then Brigadier was dispatched to Northern Ireland, which itself was on the cusp of a renewed Irish republican struggle against British rule in that province of the United Kingdom. One of Kitson’s innovations was the recruitment of what he called “counter gangs”. For his endeavours and “meritrocious service”, he was later knighted by the British Queen, later going on to serve as her aide-de-camp and elevated to Commander-in-Chief of UK land forces from 1982-1985. The callous objective devised by Kitson was to use British proxy death squads to sow as much terror and mayhem as possible in order to destroy popular insurgency. This was the beginning of Britain’s policy of collusion in Northern Ireland, which operated for nearly three decades and claimed hundreds of lives. From the British government point of view, one great advantage of this policy was to provide “plausible denial” to the authorities for the state terrorism that they were unleashing. This advantage still pertains to this day, as can be seen from the latest review into Pat Finucane’s murder and the hollow apology from David Cameron “for shocking levels of collusion”. There is little doubt that the British state at the highest level ordered Mr Finucane’s assassination. During the 1980s, he was a formidable young lawyer, successfully defending dozens of individuals who had fallen foul to the British system of repression and corruption of the legal process. Finucane was a thorn in the side of the British establishment, exposing its vicious policies of criminalising republican political opponents. On 17 January 1989, British cabinet minister Douglas Hogg addressed the House of Commons and denounced what he called “solicitors who are unduly sympathetic to the IRA [Irish Republican Army]”. Hogg later said that he had been briefed by “people who knew” - meaning British intelligence. On that fateful day, Hogg effectively signed Pat Finucane’s death warrant. Less than a month later, on 12 February 1989, a loyalist death squad sledgehammered its way into the Finucane home in Belfast while the family was having Sunday dinner. In front of his wife and three children, the gunmen shot Pat Finucane 12 times in the head as he lay prone on the floor of the kitchen, his terrified children huddled under the dining table as shot after shot rang out. After 23 years of the family’s courageous campaigning for justice, David Cameron admitted this week that the murder was carried out by loyalists in collusion with British intelligence, which had provided the killers with target details and helped in their escape on the day of the killing. But this appalling murder is but the tip of a sordid iceberg that reveals systematic state terrorism by the British government and its military over decades in Northern Ireland. A year before Pat Finucane’s murder, British military intelligence oversaw the smuggling of hundreds of high-powered weapons from South Africa to their loyalist paramilitary operatives in Northern Ireland. The consignment included AK47 assault rifles, Browning semi-automatic pistols and fragmentation grenades. In a seminal investigative study by Belfast-based civilian campaign group, Relatives For Justice, titled Collusion: 1990-1994, it was found that this supply of firepower by British intelligence to loyalist death squads resulted in a dramatic escalation of murders by these same gangs. Based on forensic and ballistics data, the weapons from South Africa were used in as many as 300 murders by loyalist death squads - nearly 10 per cent of the total death toll during the entire conflict. Some of the victims of state-sanctioned murder were republican activists, but many more were just ordinary civilians. The murder of Pat Finucane is just one out of hundreds of killings in Northern Ireland that the British authorities perpetrated in their policy of collusion with death squads. It is a policy that grew out of its terror campaigns in East Africa and Asia and which was “optimized” in Northern Ireland. The political objective was to terrorise the population in the North of Ireland into accepting a “peace process” during the 1990s that falls way short of the legitimate claim to national self-determination and independence of a united Ireland. Unfortunately, it may be seen as having been a partial British success given that Northern Ireland still remains a sectarian territory under British jurisdiction - despite the aspirations of the majority of Irish people across the entire island. In Syria, of course, the political conditions are different. There, the majority of Syrian people support the government in Damascus and are opposed to foreign interference. The so-called uprising that the Western governments and their servile propaganda news media trumpet is nothing but a foreign covert criminal war of aggression fuelled by foreign weaponry and mercenaries. Nevertheless, one can still discern the malevolent hand of British state terrorist expertise: the training, weapons, intelligence and logistics. Moreover, the use of terror gangs to inflict mayhem and sectarian bloodletting is straight out of the British military manual, as devised by General Sir Frank Kitson. As car bombs tear through the bodies of Syrian schoolchildren and as loved ones end up in side-street gutters with bullets in the head - this is classic British policy of using terroristic means to achieve nefarious political ends: in this case, the dismemberment of Syrian society and the implementation of regime change."